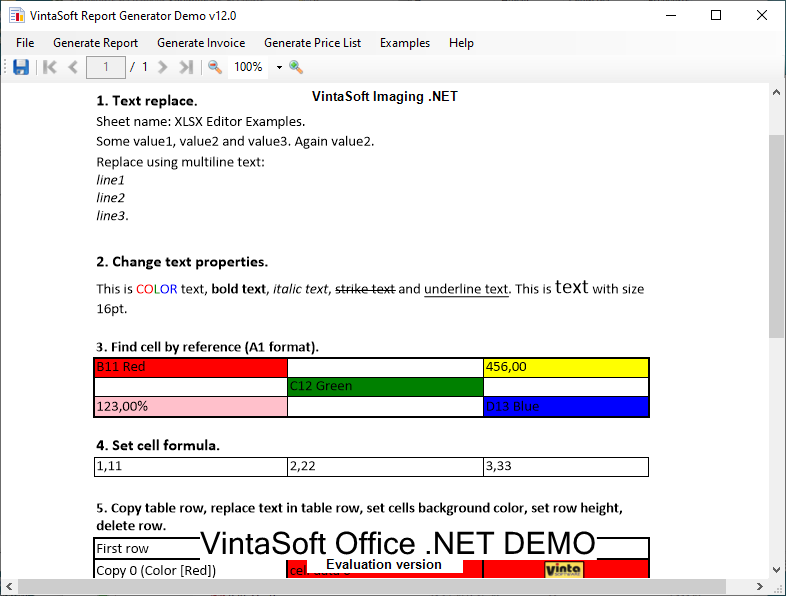 VintaSoft Imaging .NET SDK comes with demo applications for WinForms, WPF, ASP.NET WebForms and ASP.NET MVC demonstrating the general SDK features. 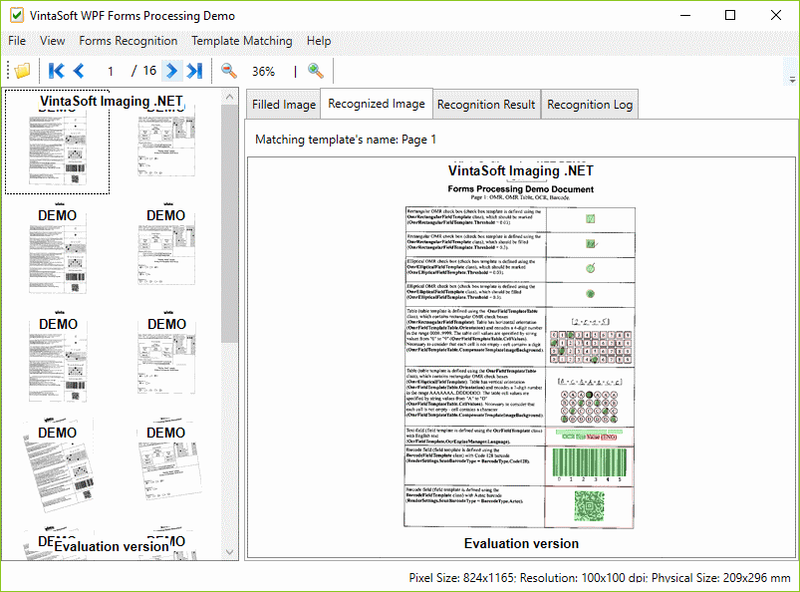 The demo applications simplify the process of SDK functionality evaluation allowing quickly determine whether it suits your specific requirements. 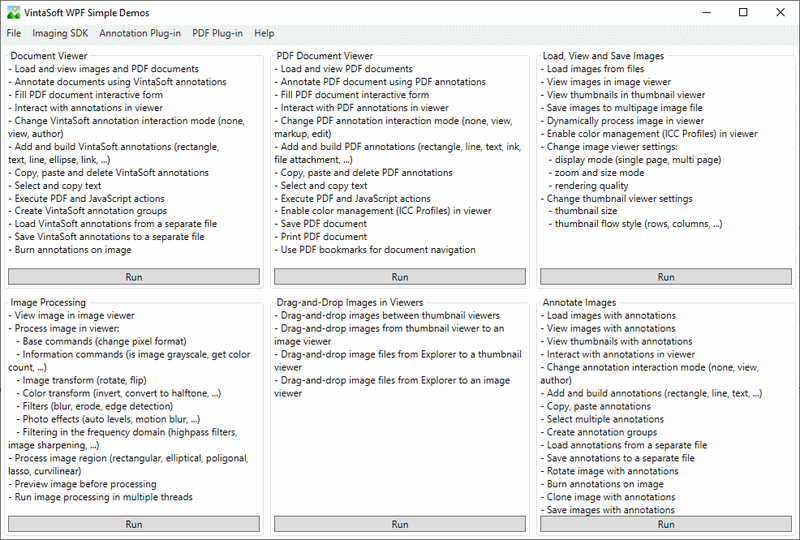 Please see below the full list of demo applications offered for the SDK evaluation. Imaging Demo shows how to load, view, process, print and save images. 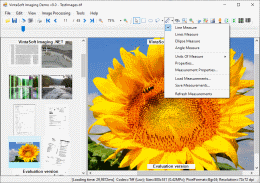 Several image files can be loaded into one image collection. 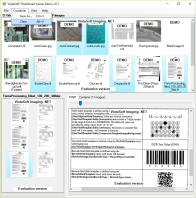 Thumbnail viewer shows thumbnails of images from the image collection, image viewer shows single image from the image collection. 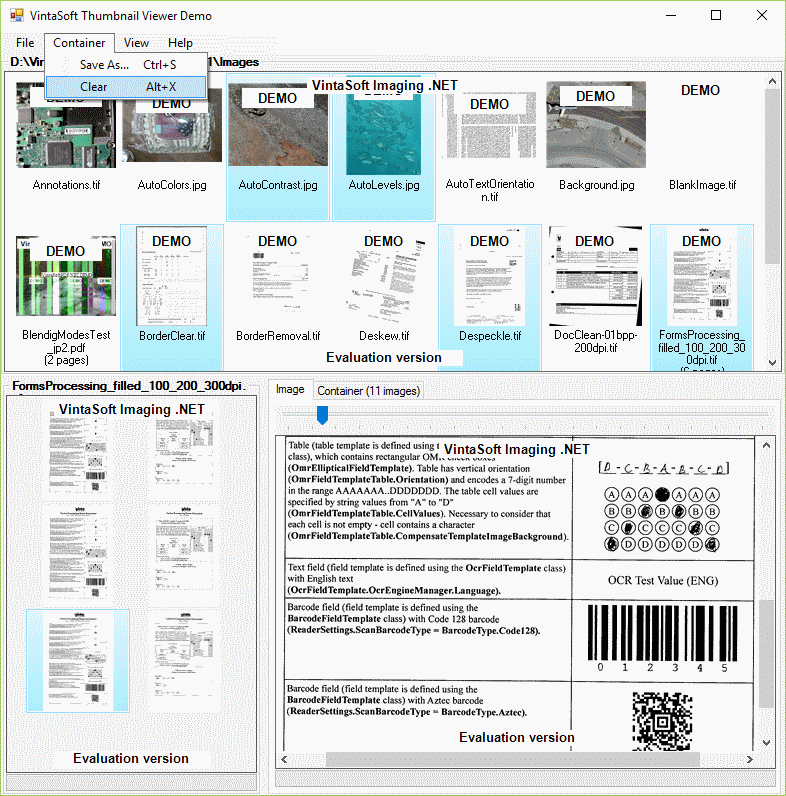 Single image from the image collection can be scrolled, zoomed, viewed with magnifier, processed, printed, saved to clipboard or file, deleted from the image collection. 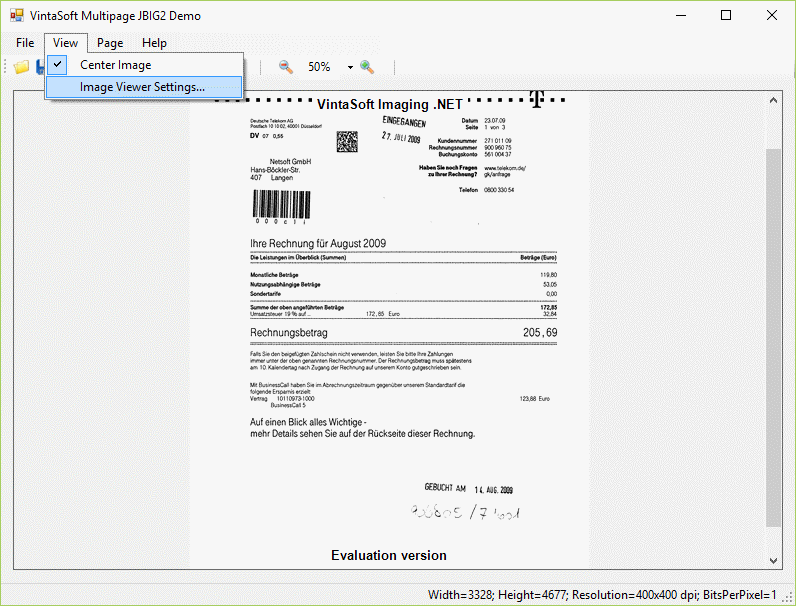 Resulted image collection can be saved as multipage TIFF, GIF, JBIG2 file or PDF document, and more. 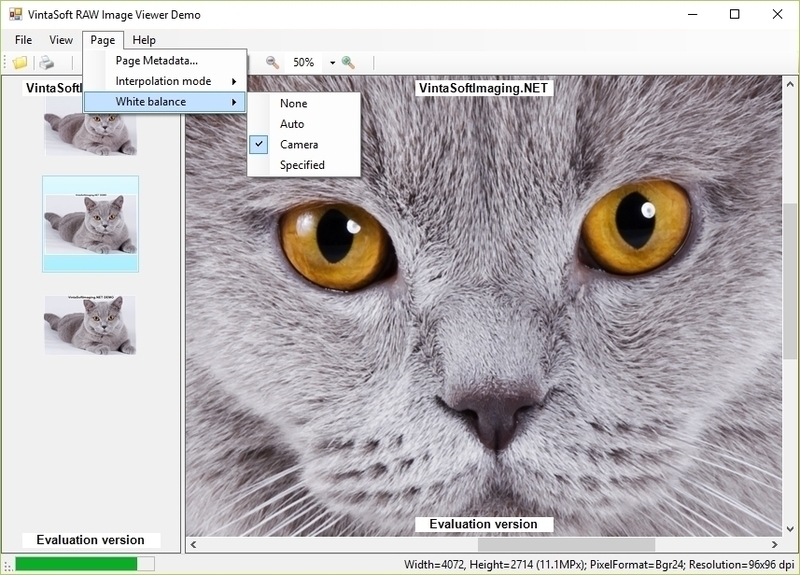 Image Processing Demo shows how to display both source image and processed image in two customizable viewers, specify a list of image processing commands for execution and set individual parameters for each command, process the image with a sequence of image processing commands, and get the results and progress of image processing. 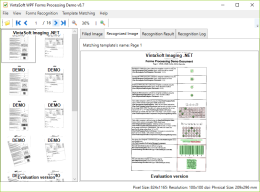 Annotation Demo shows how to manipulate annotations: create, process, delete, merge with image, save or load to or from XML, JPEG, TIFF, PNG or PDF file. 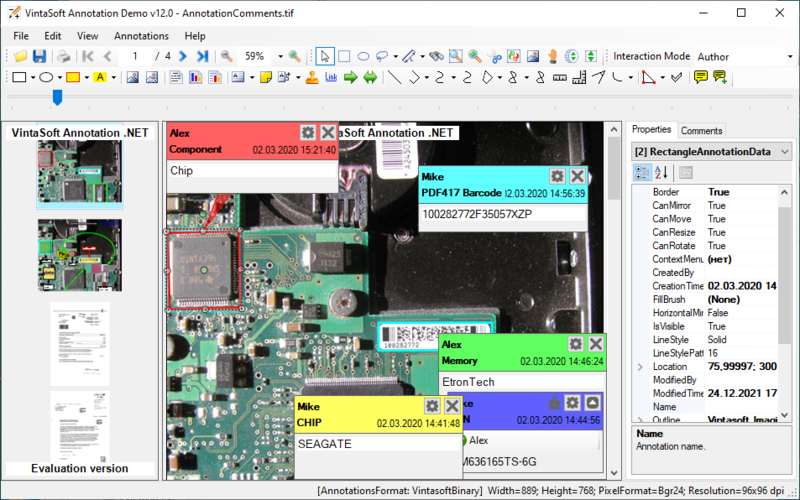 It contains an implementation of custom-created triangle and mark annotation, as well as AnnotationsToolStrip control. 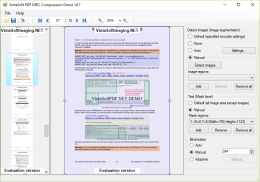 PDF Editor Demo shows how to create, view and manipulate PDF document. 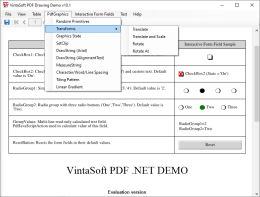 It allows to create a new PDF document or open an existing PDF document. 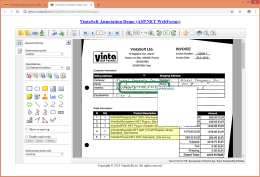 New pages can be added or removed to or from PDF document. 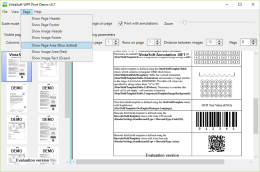 Image resources of PDF document can be viewed or saved to raster image files. 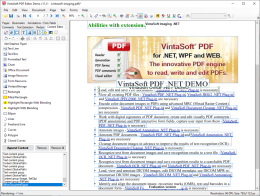 PDF document can be packed and optimized to reduce its size. 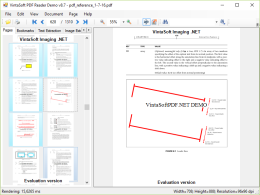 Pages of PDF document can be changed by drawing images or vector graphics on them. 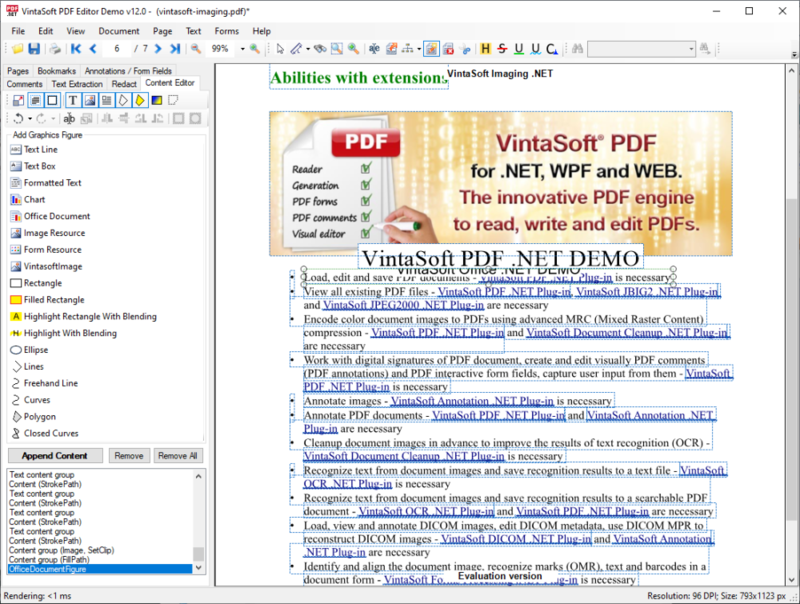 Text can be searched, found and extracted from PDF page, and more. 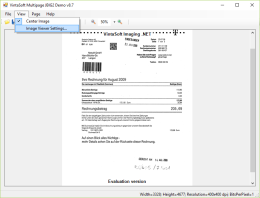 OCR Demo shows how to recognize text from documents loaded from file or acquired from scanner. 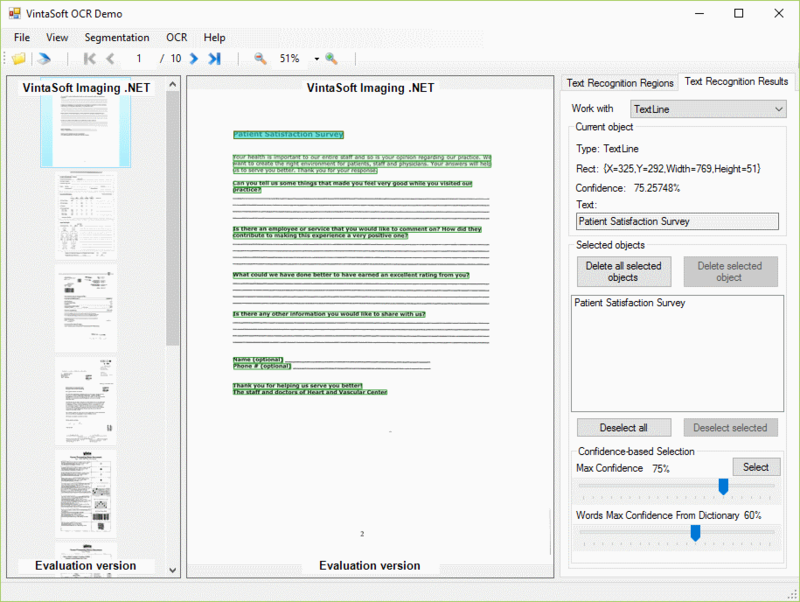 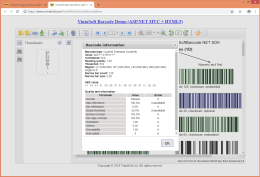 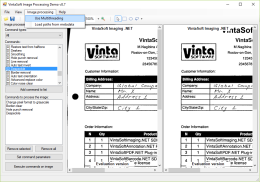 Edit OCR results using an interactive, user-friendly interface. 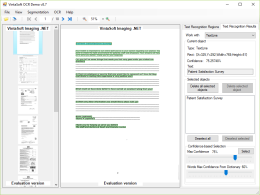 Save OCR results into text files or searchable PDF files. 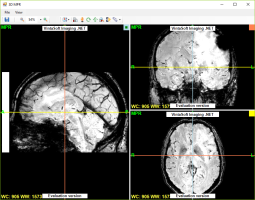 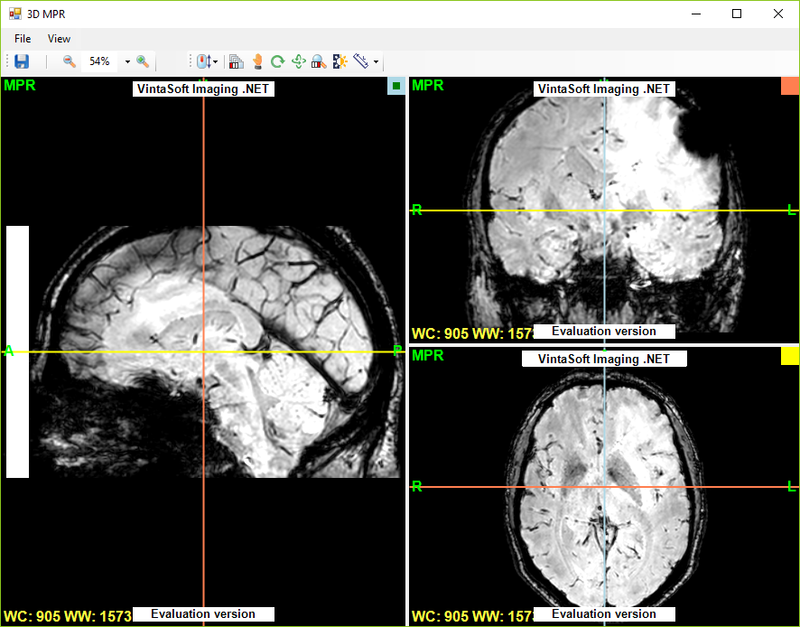 DICOM Viewer Demo shows how to load and display medical image file of DICOM standard, handle patient metadata and apply DICOM MPR. 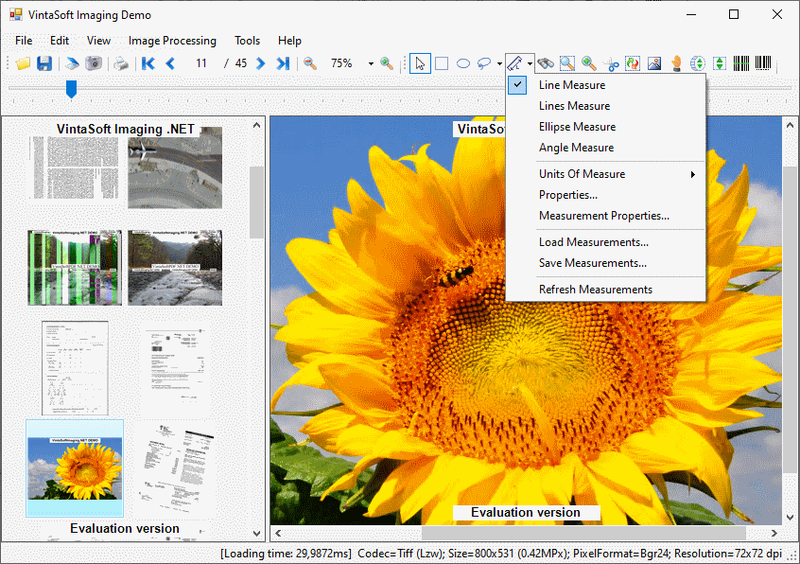 Large Image Viewer Demo shows how to display very large (gigapixel) images using progressive multithreaded loading by parts. 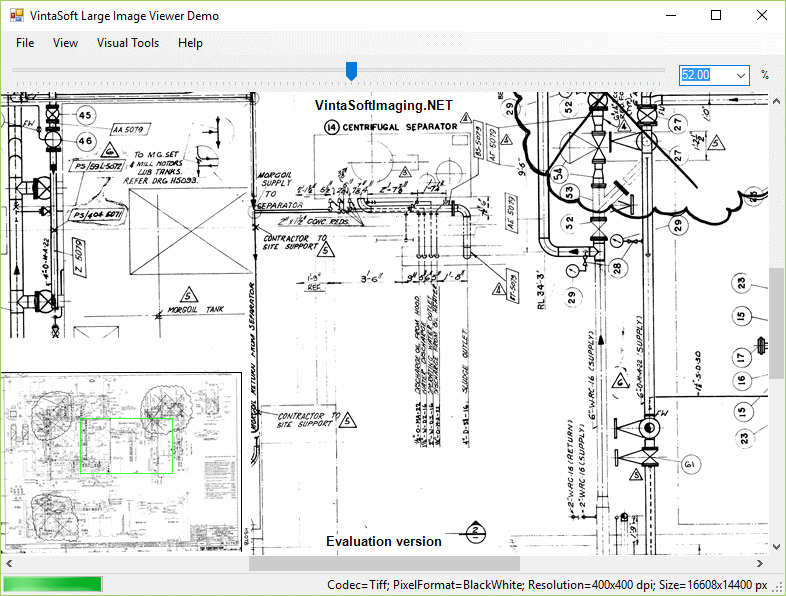 Special image map allows fast navigation along the large image. 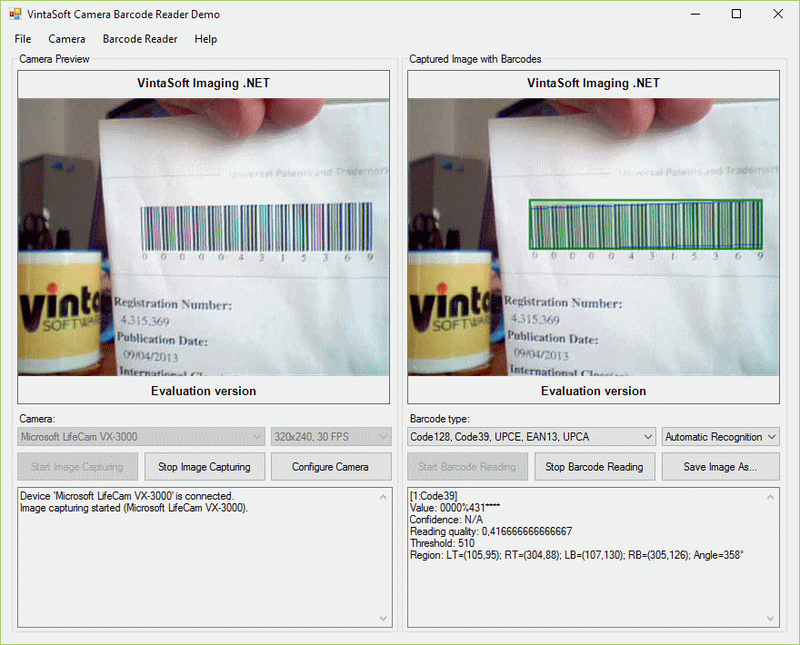 The image can be viewed in full screen mode. 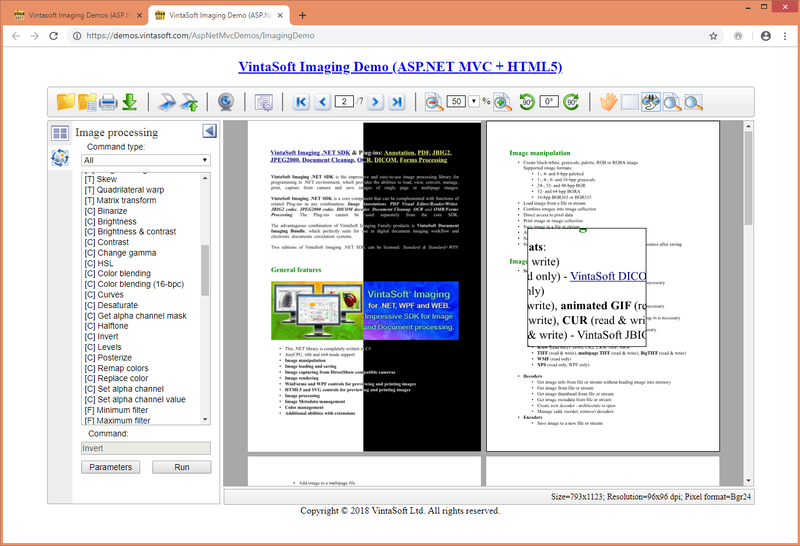 Thumbnail Viewer Demo shows a realization of Folder Thumbnail Viewer allowing to view thumbnails of first multipage file pages from a chosen folder, view thumbnails of selected multipage file in thumbnail viewer, view full-size image of selected thumbnail in image viewer and drag-and-drop thumbnails into a special container for further saving to multipage TIFF or PDF file. 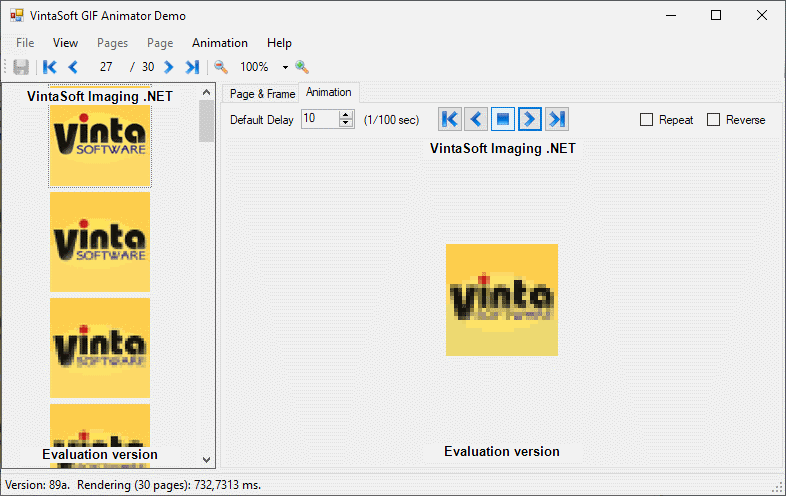 The demo also shows how to customize the visual appearance of displayed thumbnails. 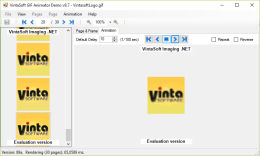 Multipage TIFF Demo shows how to view and manipulate multipage TIFF file without usage of any temporary file. 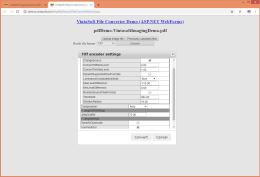 All pages of TIFF file can be viewed in the image viewer, new pages can be added or inserted to TIFF file, some pages can be deleted from TIFF file, TIFF file can be splitted to separate single image files. 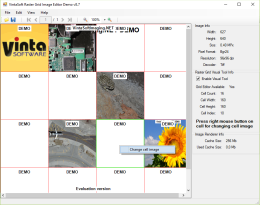 Raster Grid Image Editor Demo shows how to create and open TIFF images of unlimited size composed of tiles or strips as well as JPEG2000 images composed of tiles, with the ability to edit tiles or strips, save and undo changes. 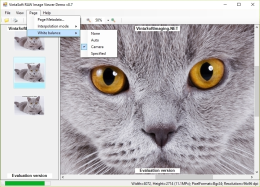 GIF Animator Demo shows how to create, display, manipulate, pack and save animated GIF file. 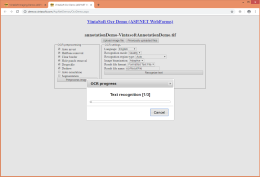 Work with GIF animation: start/stop, show in browser, set delay, repeat, reverse. 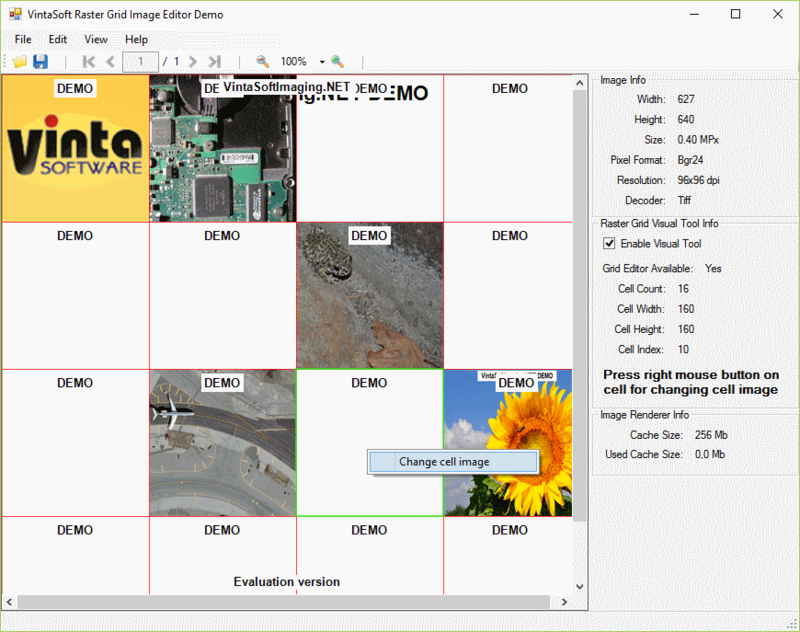 Icon Editor Demo shows how to load, save, create, manipulate and edit ICO and CUR files. 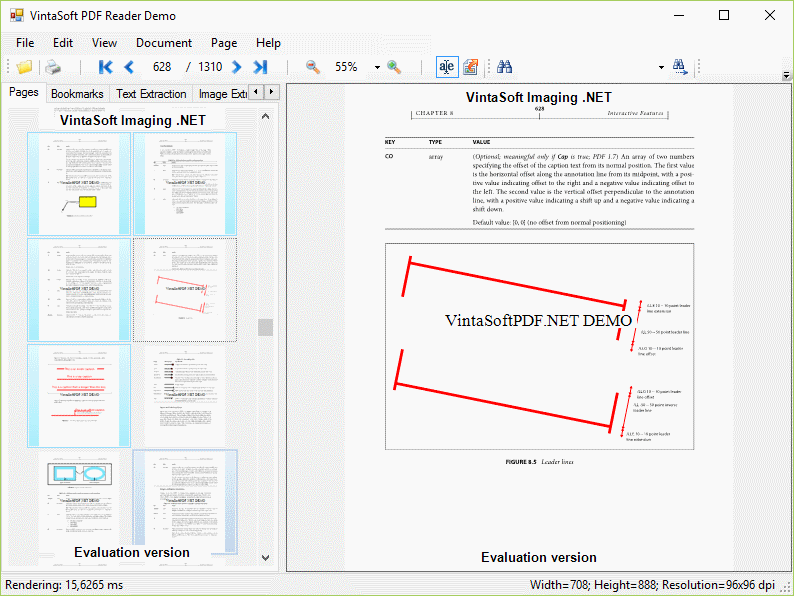 PDF Reader Demo shows how to load, view, navigate and print an existing PDF document, and more. 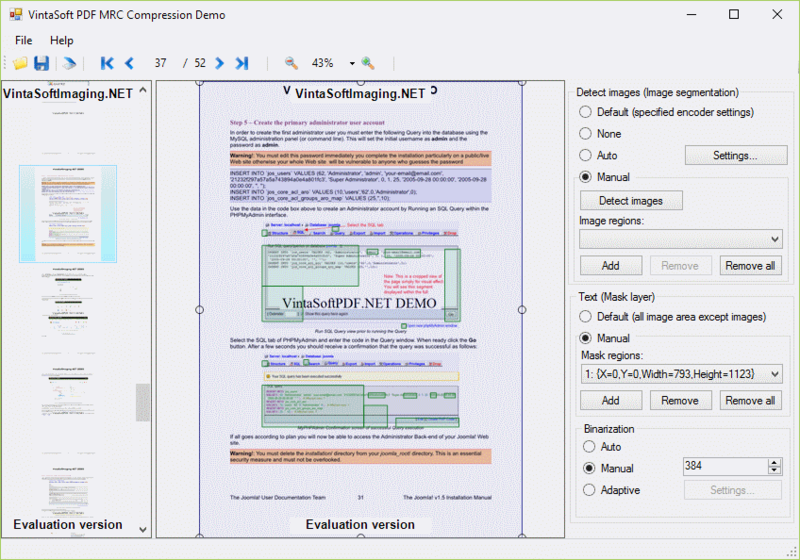 PDF MRC Compression Demo shows how to encode color document images to PDF format using PDF MRC compression by loading images from file or acquiring from scanner. 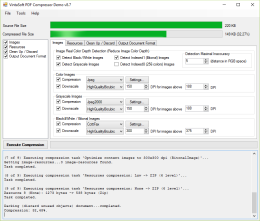 PDF Compressor Demo shows how to use the SDK facilities to optimize and compress content of any PDF file for getting its smallest size. 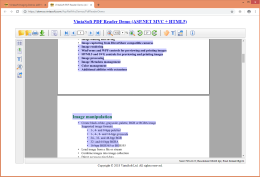 PDF Structure Editor Demo shows how to create a new or load an existing PDF file, as well as the abilities to view, navigate, add, modify or remove pages and bookmarks of PDF document, view image resources of PDF document, get information about PDF document, save modified PDF document, save PDF image resources to any supported raster image format, convert PDF document to desired version of PDF specification, pack and optimize PDF document content, and more. 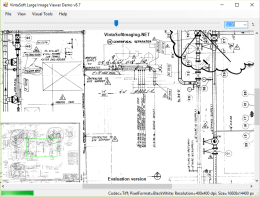 PDF Drawing Demo shows the vector graphics facilities of PdfGraphics Class by example of creation new PDF pages. 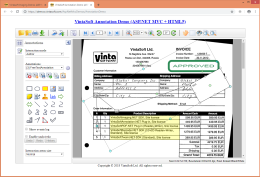 PDF Report Generator Demo shows how to create reports on the fly, using graphical figures and interactive forms, and save them to a PDF document. 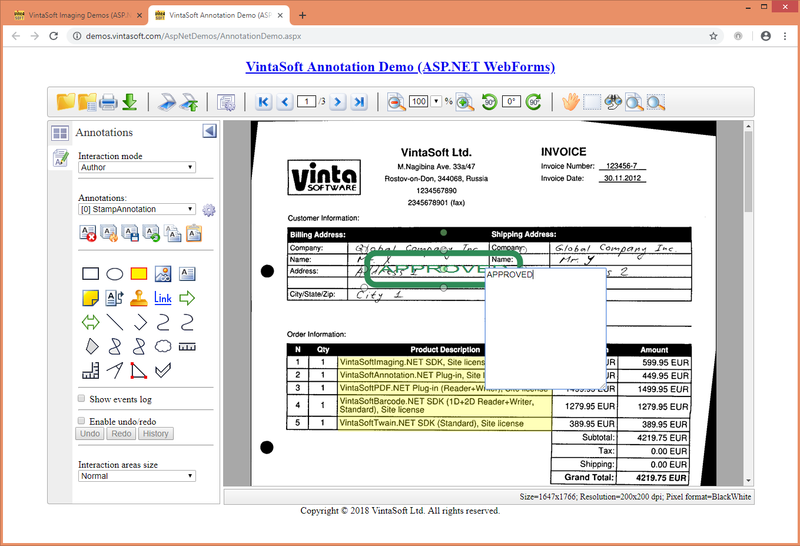 Forms Processing Demo shows how to define the template of unfilled form, identify and align the filled form, recognize marks, text and barcodes in the filled form, display the results of form recognition. 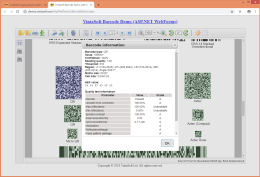 The demo includes source codes of form field that contains barcode. 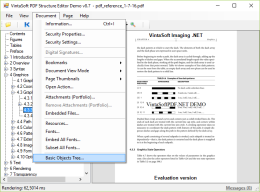 Multipage JBIG2 Demo shows how to view and manipulate multipage JBIG2 file in .NET. 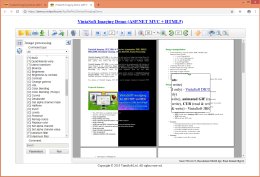 All pages of JBIG2 file can be viewed in the image viewer, new pages can be added or inserted to JBIG2 file, pages can be deleted from JBIG2 file, JBIG2 file can be splitted and converted to separate image files of supported format, and more. 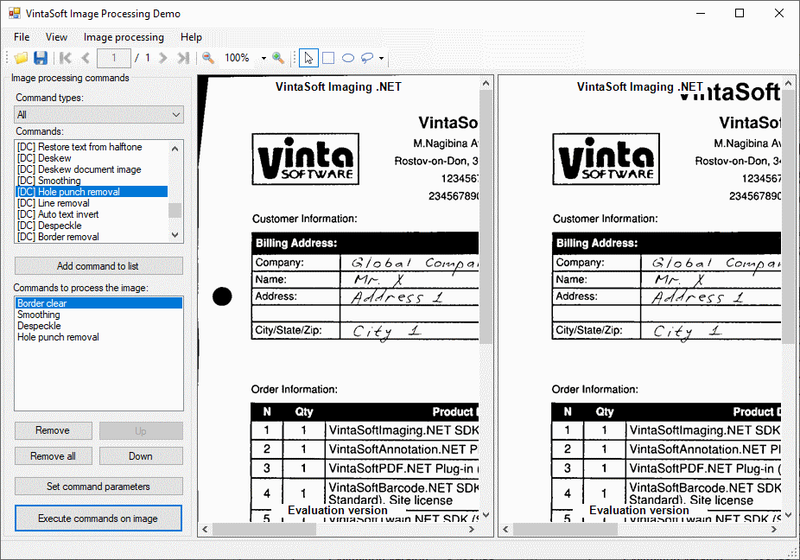 Print Demo shows how to print single image or collection of images. 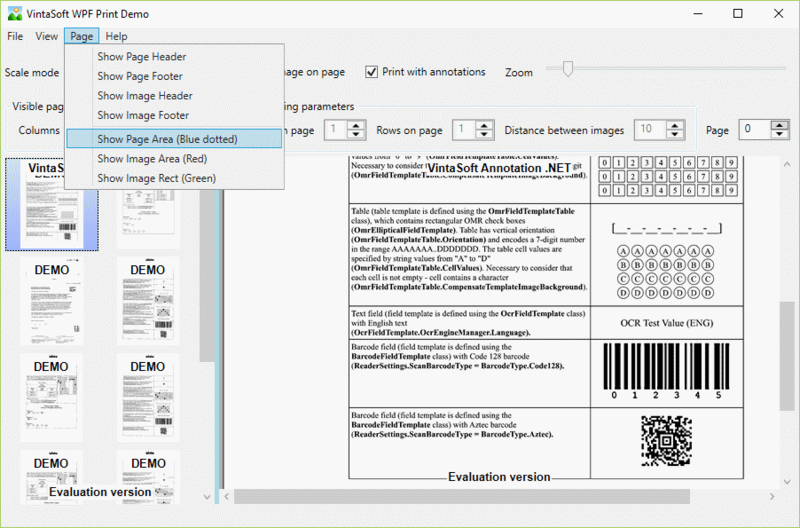 The image can be divided and printed on several pages, single image can be stretched or cropped to page margins, several images can be combined and printed onto one page, and more. 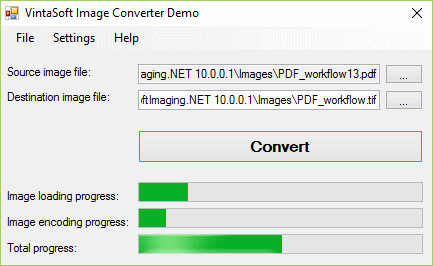 Image Converter Demo shows the possibility to convert all supported image formats back and forth. 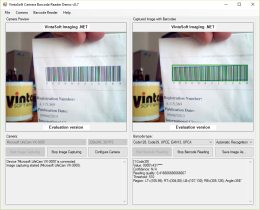 Camera Barcode Reader Demo shows how to capture images from camera which supports DirectShow architecture using VintaSoft Imaging .NET SDK and read barcodes from captured images on the fly using VintaSoft Barcode .NET SDK. Multi Camera Demo shows how to capture images from multiple cameras and save them to files, monitor available devices (webcams) and change their capturing fomat. 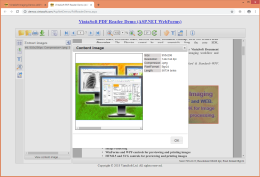 RAW Image Viewer Demo shows how to load, display and print thumbnail, preview image or original image of RAW file, render original image with different interpolations and with or without white balance correction, view metadata. 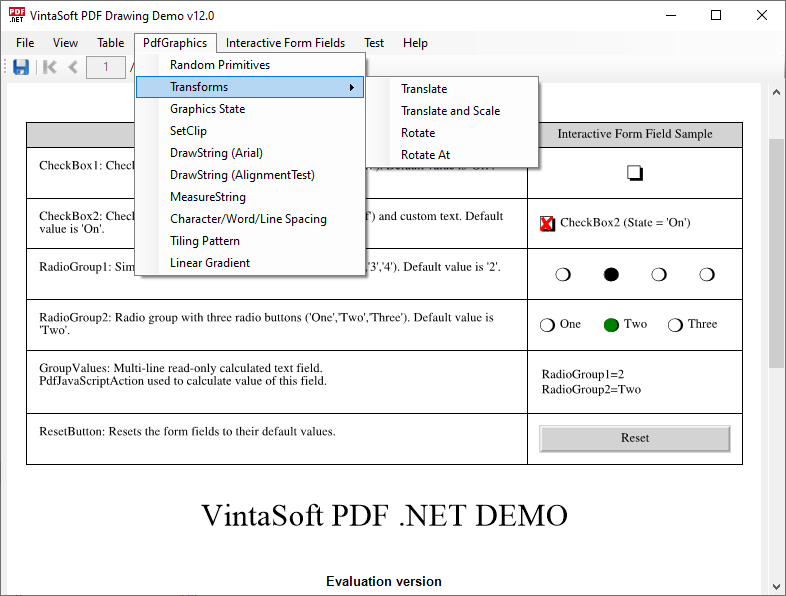 Simple Demos includes a set of mini-demo applications. 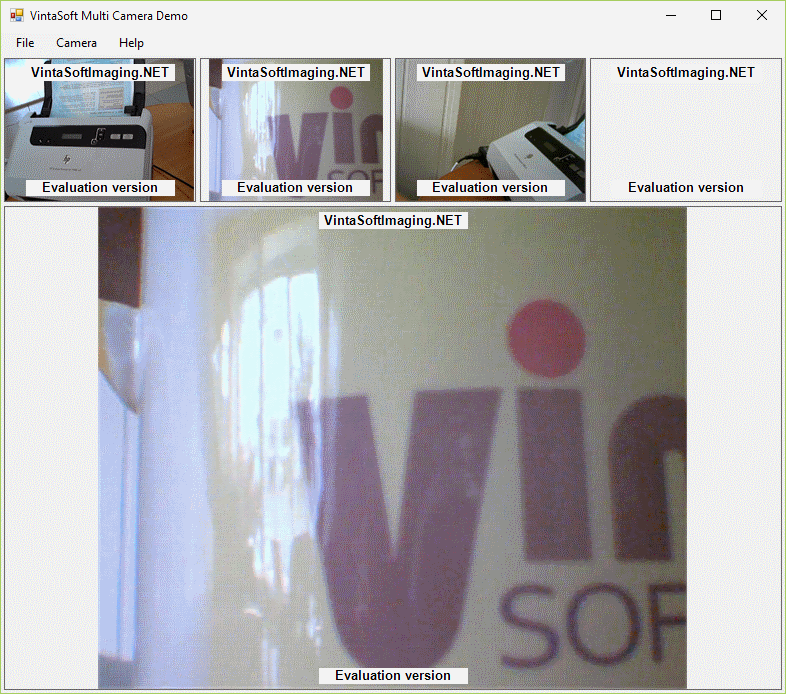 Each mini-demo application is independent and shows one or several SDK features. 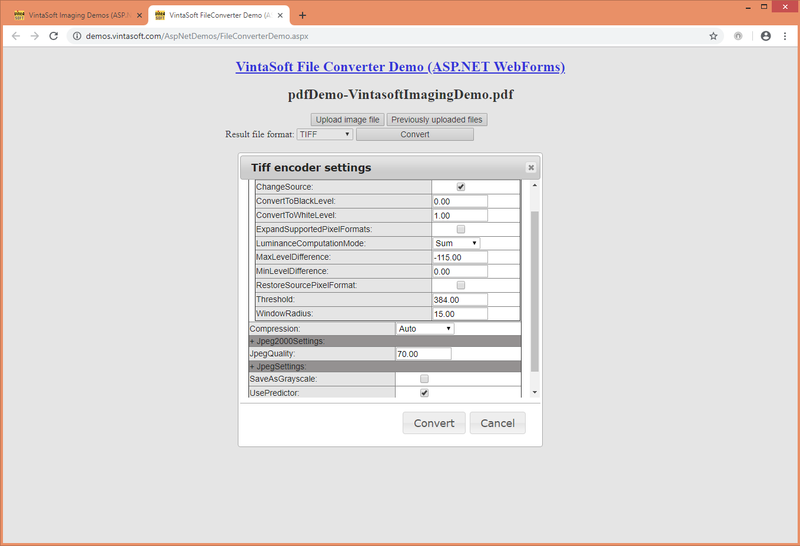 Imaging Demo shows how to view and process images and PDF documents in ASP.NET MVC application. 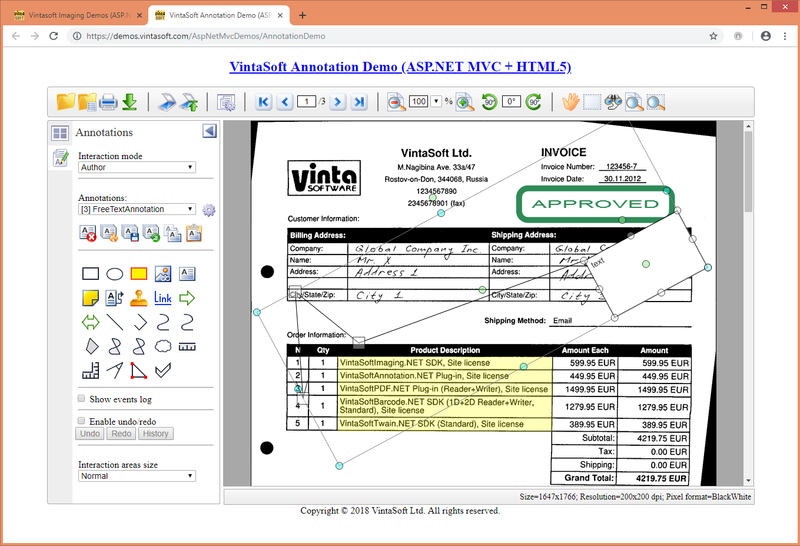 Annotation Demo shows how to view and annotate images and PDF documents in ASP.NET MVC application. 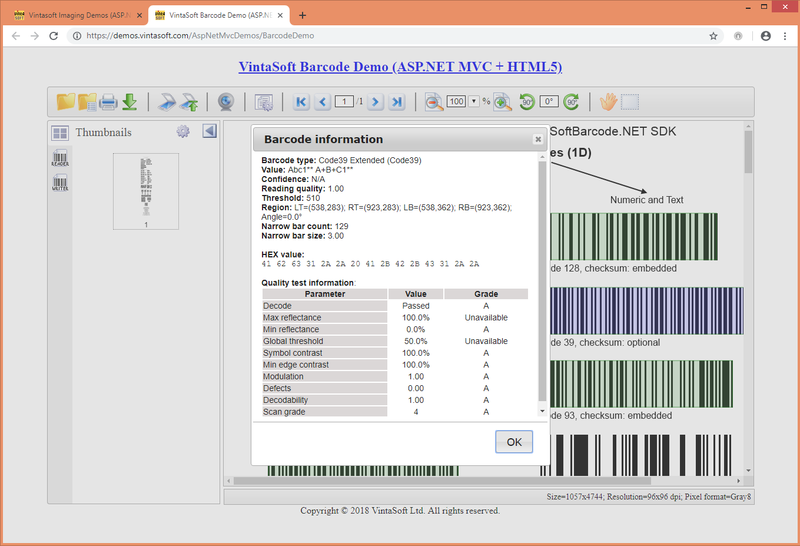 Barcode Demo shows how to read and write barcodes in ASP.NET MVC application. 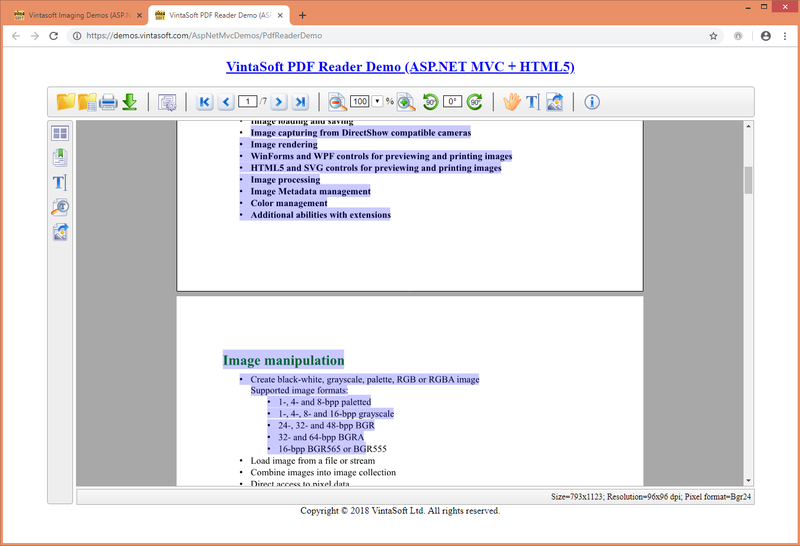 PDF Reader Demo shows how to view PDF documents in ASP.NET MVC application with support for bookmarks and thumbnails. 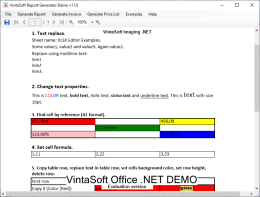 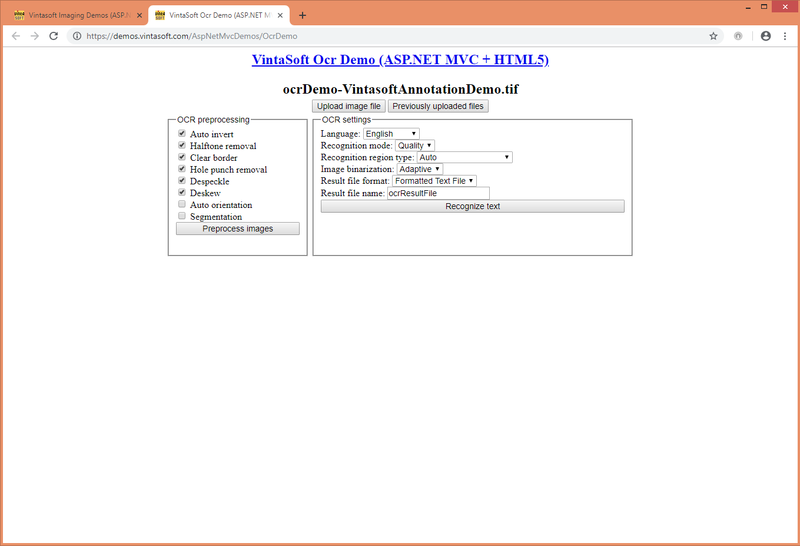 OCR Demo shows how to recognize text in images and save the recognized text as text file or PDF document in ASP.NET MVC application. 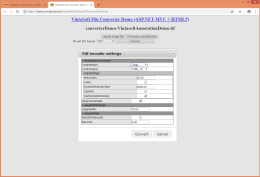 File Converter Demo shows how to convert an image file or PDF document to another PDF document or image file in ASP.NET MVC application. 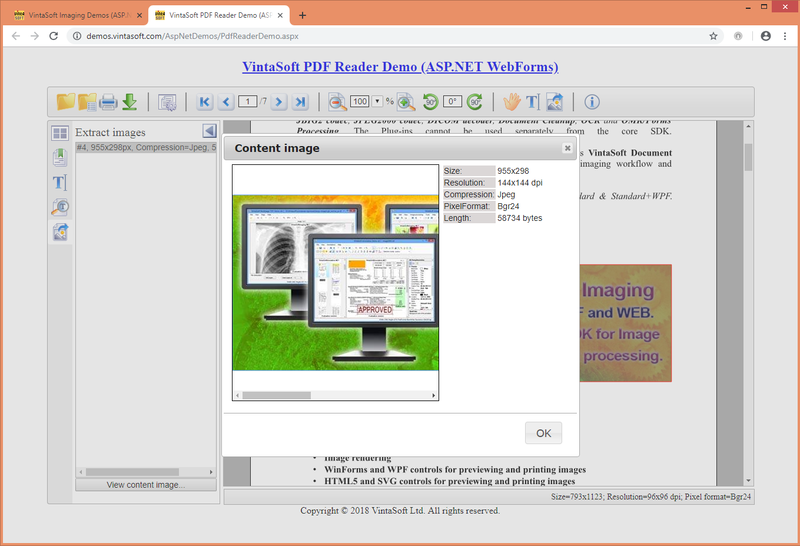 Imaging Demo shows how to view and process images and PDF documents in ASP.NET WebForms application. 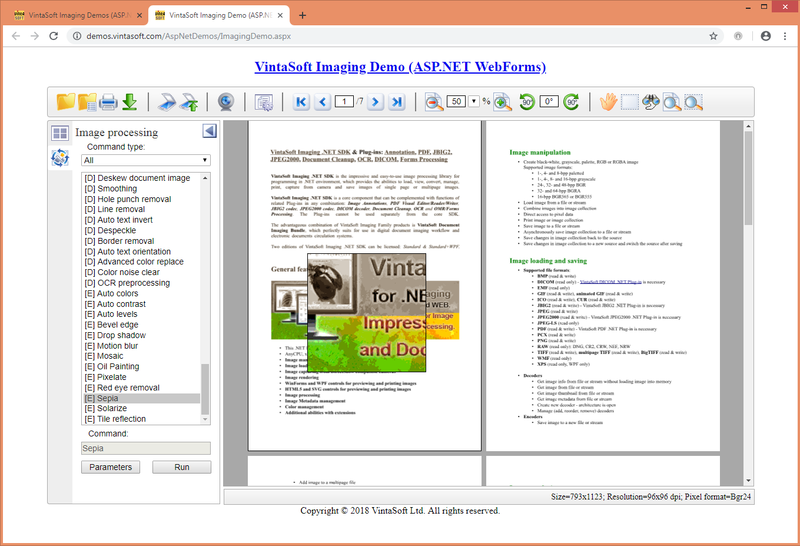 Annotation Demo shows how to view and annotate images and PDF documents in ASP.NET WebForms application. 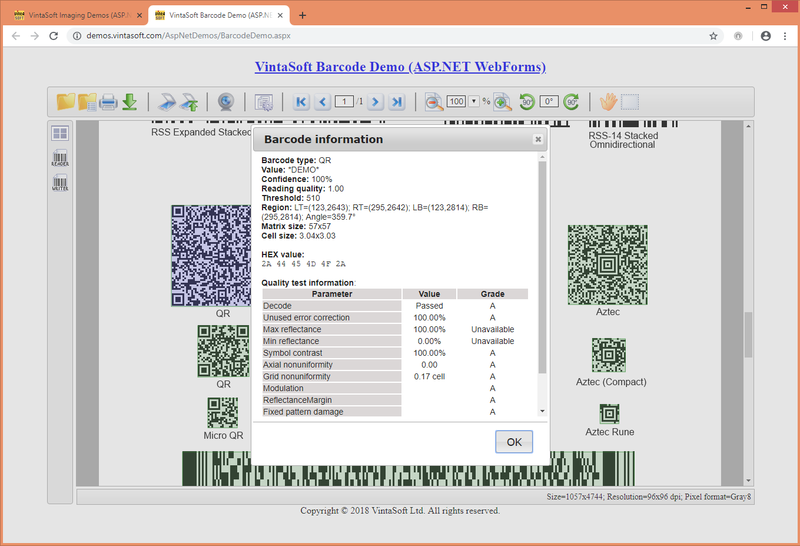 Barcode Demo shows how to read and write barcodes in ASP.NET WebForms application. 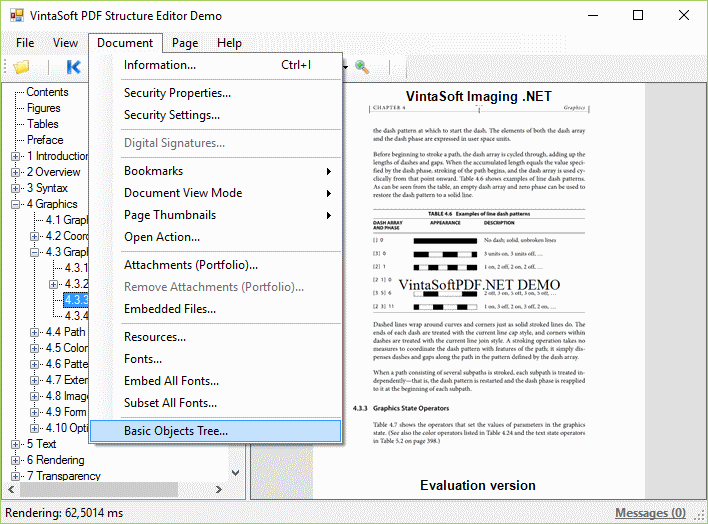 PDF Reader Demo shows how to view PDF documents in ASP.NET WebForms application with support for bookmarks and thumbnails. 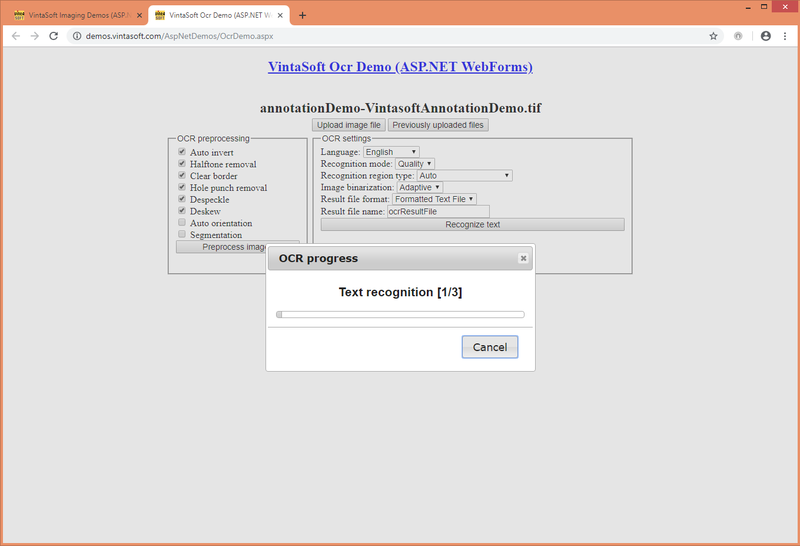 OCR Demo shows how to recognize text in images and save the recognized text as text file or PDF document in ASP.NET WebForms application. 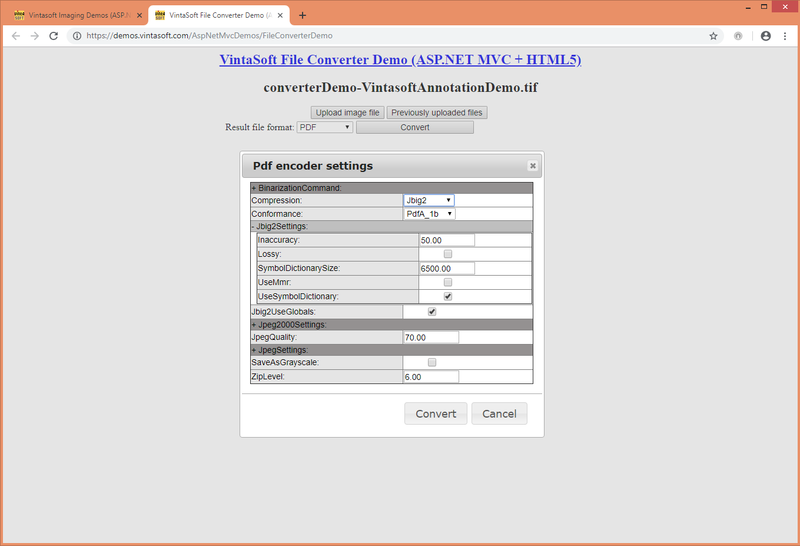 File Converter Demo shows how to convert an image file or PDF document to another PDF document or image file in ASP.NET WebForms application.